If you want a cute, fun, short read, and you like vampires, here's one for you. Joleene Naylor writes a tip book. She is currently dating a vampire and since there aren't any Facebook pages for humans dating vamps, so she shares some tips. 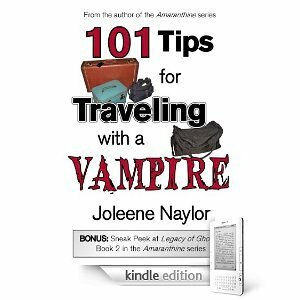 101 Tips for Travelling with a Vampire is broken into sections for your easy reading. There's tips on lodging, packing, travelling by car, train, boat and plane, and foreign travel. They are all filled with humorous antidotes. 25 Tips for Dealing with Your Vampire reminds you, that staking your boyfriend as a way to break up with them, may not be ideal. Like I said, it's a good, easy, fun book.